Kitchen granite countertops are often featured in countless magazines and websites because they are a beautiful addition to any kitchen. This natural stone is the perfect building material. It is stain and heat resistant. It resists scratches too. It also comes in numerous colors to complement cupboards, flooring, and paint. Consider these tips for choosing the best granite countertop colors. Homeowners and contractors love the huge number of colors, patterns, flecks and streaked slabs. They love to choose from those colors for kitchen granite countertops. Colors range from shades of blacks, grays, beiges, browns, golds, blues, whites, pinks, reds, greens and yellows. They provide enough variety to fit small cozy kitchens or a large contemporary kitchen. Study the colors in your cabinets. Pull out one or more colors from the cabinets to tie in with the colors of the granite. Consider these two popular options. You can choose countertops which are the same overall color of the cabinets. For example, your cabinets are painted white. Then you might choose white granite with veins or speckles in hues of gray, black or brown. The white in the cabinets and granite tie the two together- The speckles or veins add a splash of color and interest. In this example, you introduce a new contrasting background color like Betularie or Bordeaux in the granite. You match one or more colors of the flecks in the granite to the color of the cabinets. Aqua Kitchen and Bath Design Center regularly stocks more than 200 types of granite slabs. You can match or contrast your kitchen cabinets. • Cabinets with cherry staining look well with Verde Peacock, Uba Tuba Granite or Typhoon Bordeaux Granite. • Dark brown kitchen cabinets are frequently matched with Costa Esmeralda, Lemon Ice or Labrador Green granites. • Light or honey colored cabinetry looks very good with Netuna Bordeaux or Typhoon Bordeaux Granite. 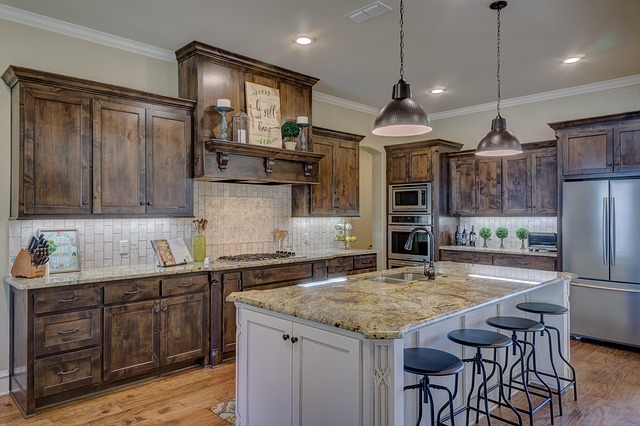 • Maple colored cabinets are often paired with gray, white or beige colored granites. 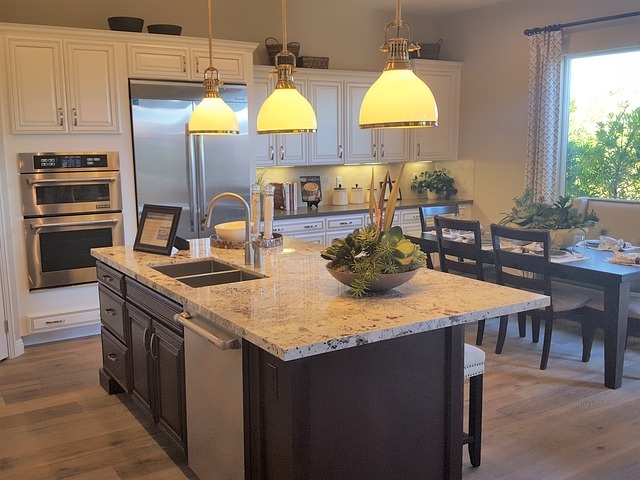 Natural light from windows and kitchen lighting helps to show off the beauty of your new kitchen granite countertops. 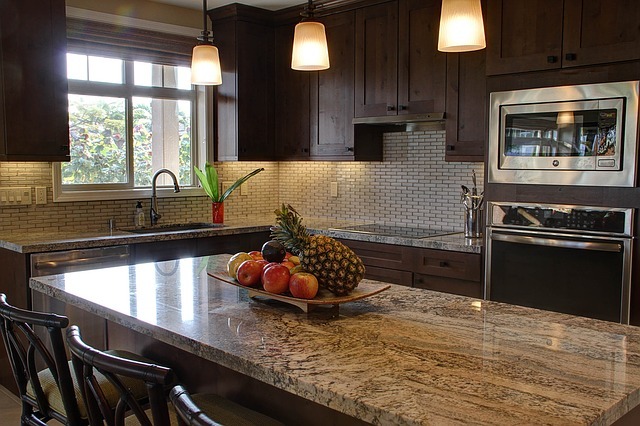 If lighting is poor, consider granite colors with more light-colored veins or specks. This way you will enhance the appearance. You can also consider darker granite colors when there is substantial lighting. If you want the best granite countertop installed in your home, you should do it right by shopping at a showroom like Aqua Kitchen and Bath Design Center. Most showrooms carry the granite on-site. There you’ll be able to see the colors, veins, and beauty of each unique slab. Looking at photographs of slabs online may give you a general idea of what each type looks like. However, there is no comparison to seeing the real granite on-site. When selecting granite on-site at a showroom, make sure you come prepared with a cabinet door, wall paint sample, and a flooring sample. By bringing all three of the samples to view next to the granite on-site, you’ll be in a better position. You will be able to see what colors truly match. You will also be able to see what accents work the best for your color schemes. Once you have narrowed down some of your color choices, ask us for samples to take home. Cover your existing countertop with a neutral colored towel and place samples on top. This is how you’ll be able to see how each color looks in your kitchen. You will also be able to see what color looks best with your particular type of lighting. If you’re looking for the best granite countertop in Wayne, New Jersey, stop by Aqua Kitchen and Bath Design Center. Feel free to call us for a free estimate to get started.